I am an Assistant Professor at the Department of Computer Science at Aarhus University. I do research at the intersection of Human–Computer Interaction, Ubiquitous Computing and Information Visualization. I'm broadly interested in addressing interaction challenges with non-traditional interactive technologies, and particularly in designing technology that puts people back in control of their digital environments. My research spans topics such as making ubiquitous computing and context-aware technologies intelligible or understandable (I've recently looked into how that relates to explainable AI); the design principle feedforward; addressing interaction challenges and dark patterns in proxemic interactions; and facilitating the design and development of multi-device and cross-device user interfaces. For more details about my work, have a look at my list of publications or my Google Scholar profile. My PhD dissertation investigated how to design for intelligibility and control in ubiquitous computing environments, and was awarded with the 2015 FWO - IBM Innovation Award; this award is given annually to the best Belgian PhD dissertation in computer science. My research has also received a number of awards and nominations at premier Human–Computer Interaction venues, including a Best Paper Award at DIS 2014 and a Best Paper Honorable Mention Award at CHI 2013. 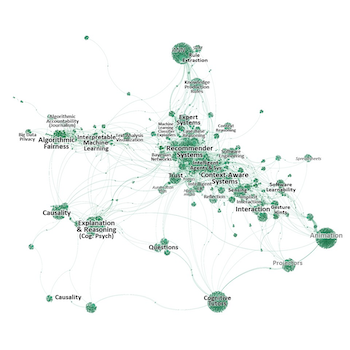 Before joining Aarhus University, I was a Postdoctoral Fellow in the Innovations in Visualization Laboratory at the Interactions Lab at the University of Calgary, where I worked with Sheelagh Carpendale. Before that, I did a postdoc with Russell Beale at the HCI Centre of the University of Birmingham, working on mobile and context-aware technology and behaviour change intervention technologies. I received my PhD in Computer Science in 2014 from Hasselt University, working with Kris Luyten and Karin Coninx in the EDM HCI group. 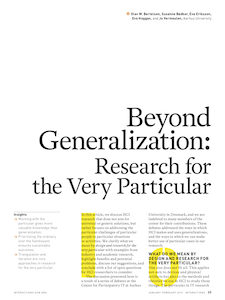 Our article "Beyond Generalization: Research for the Very Particular" has been published in the recent issue of ACM interactions. The article summarizes discussions and debates at the Participatory IT center at Aarhus University on research that does not aim for universal or generic solutions, but rather focuses on addressing the particular challenges of particular people in particular situations or activities. Our paper "Subliminal Semantic Number Processing on Smartphones" has been accepted to MobileHCI 2018. 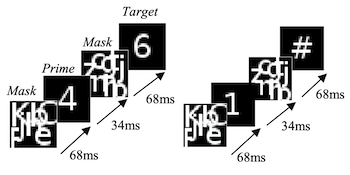 This paper continues on our earlier MobileHCI '17 paper to investigate whether people can extract meaning from subliminal presentation of information in mobile contexts. We found that overall, the impact is effectively negligible for practical applications. Our paper "Manipulating Holograms: Implications for AR Gesture Design" has been accepted to DIS 2018. 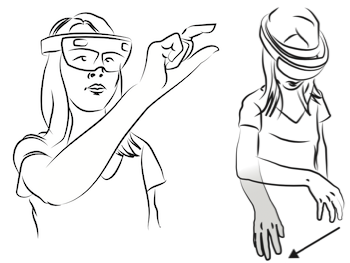 The paper presents a gesture elicitation study with the Microsoft HoloLens in which we found that the scale of AR affects the types of free-hand gestures people expect to use when interacting with 3D holograms. Our paper "Digital Behaviour Change Interventions to Break and Form Habits" has been accepted to the ACM TOCHI journal, and will be presented next year at CHI 2019 in Glasgow. The paper provides an critical review of theories and models around effective habitual behavior change interventions using technology — a 68-page heroic effort led by Charlie Pinder. Our paper "Exploration Strategies for Discovery of Interactivity in Visualizations" has been accepted to the IEEE TVCG journal, and will be presented later this year at VIS 2018 in Berlin. 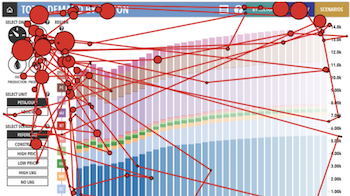 The paper presents a study of web-based energy data visualizations that provides insights into exploration strategies people use to discover the functionality of web-based visualizations. Our survey paper "Trends and Trajectories for Explainable, Accountable and Intelligible Systems: An HCI Research Agenda" in which we performed a literature analysis of 289 core papers on explanations and explainable systems as well as more than 12,000 citing papers has been accepted to CHI 2018. The paper provides insights into relations between research areas on explainable AI, intelligibility, interpretable machine learning, algorithmic accountability, software learnability, and intelligent user interfaces. Our survey paper on "Evaluation Strategies for HCI Toolkit Research" in which we survey evaluation strategies in 68 published toolkit papers has been accepted to CHI 2018. 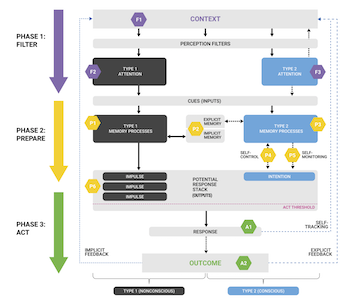 We hope this can be a starting point for students starting out in technical HCI work and helps address the difficulty of evaluating HCI toolkit research by distilling common evaluation strategies. 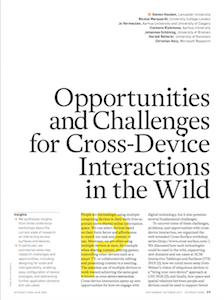 Our article "Opportunities and Challenges for Cross-Device Interactions in the Wild" that summarizes insights from our three Cross-Surface workshops has been published in the recent issue of ACM interactions. I'm very excited to announce that I have joined Aarhus University as an Assistant Professor. I will be a member of the Ubiquitous Computing and Interaction group in the Department of Computer Science. I will also be closely working with the Computer-Mediated Activity group, and look forward to being part of the larger HCI research community at Aarhus University. 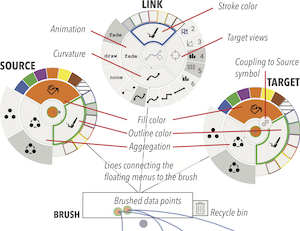 Our paper "MyBrush: Brushing and Linking with Personal Agency" has been accepted to InfoVis 2017. We extend the popular brushing and linking technique by incorporating personal agency in the interaction and show how people leveraged personal agency in different ways, configuring source, link, and target to fit their needs. Our paper "Exploring the Feasibility of Subliminal Priming on Smartphones" has been accepted to MobileHCI 2017. We explore the feasibility of subliminal priming on smartphones with three studies. 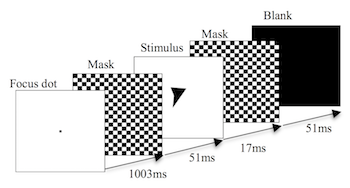 We found that although subliminal priming is technically possible on smartphones, there is limited evidence of impact, with inconsistent effects across stimuli types. Our paper "Differences That Matter: In-Clinic Communication Challenges" has been accepted to PervasiveHealth 2017. Through a literature survey and interviews, we provide an integrated view of patients’ and clinicians’ perspectives on in-clinic communication challenges. 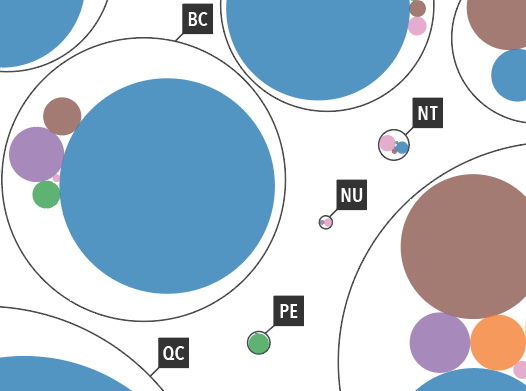 The National Energy Board of Canada (NEB) was awarded a Regulatory Excellence Award in the category "Contribution to Innovation in the Regulatory Field" for the Energy Futures visualizations. I was part of the team at the University of Calgary that designed these interactive visualizations to make the NEB's Energy Futures data accessible to the general public. The award was granted to the NEB by the Community of Federal Regulators at the Regulatory Excellence Awards ceremony in Ottawa. 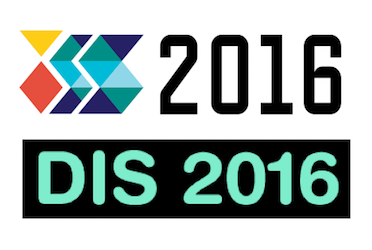 The third instalment of our Cross-Surface workshop series has been accepted to ACM ISS 2016. This year we're focusing on Spatial and Proxemic Interaction. 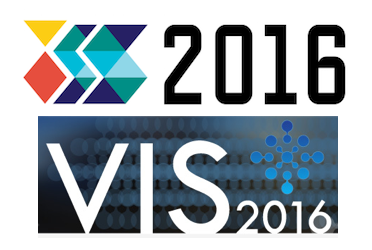 Additionally, our tutorial "Considering Qualitative Evaluation" has been accepted to IEEE VIS 2016. We're looking forward to welcome you at both events! I'm excited to announce that the visualizations that we created for Canada's National Energy Board (NEB) about their Energy Futures data are currently live. The visualizations allow you to explore energy consumption and production by region, source, and sector over time in different possible scenarios. 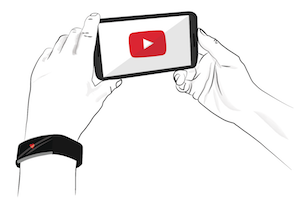 Our full paper "Heartefacts: Augmenting Mobile Video Sharing Using Wrist-Worn Heart Rate Sensors" has been accepted to DIS 2016. This was joint work with Lindsay MacDonald, Johannes Schöning, Russell Beale, and Sheelagh Carpendale. I will help with the organization of a few upcoming conferences: I am Posters Co-Chair and a member of the Program Committee for ACM ISS 2016, and an Associate Chair in the Technological Innovation Subcommittee for DIS 2016. 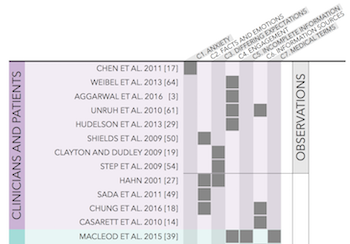 Our paper "My Phone and Me: Understanding People’s Receptivity to Mobile Notifications" has been accepted to CHI 2016. 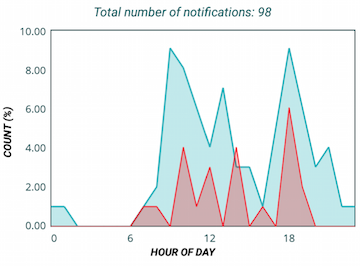 We present a study of mobile notifications that provides insights into various aspects of people's interactions with mobile notifications, including why and when people respond to them and their perceived disruption. I am very happy to announce that I joined the University of Calgary in Canada as a Postdoctoral Fellow. 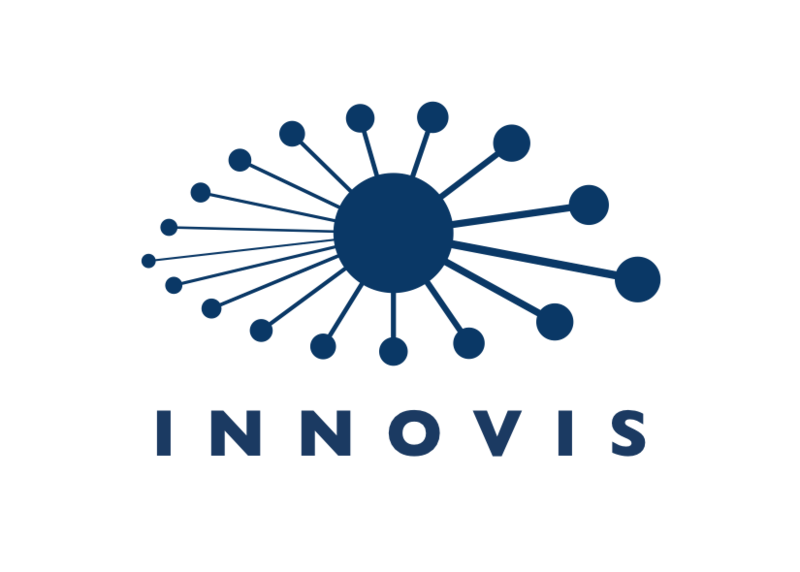 I will be working with Sheelagh Carpendale in the InnoVis group at the Interactions Lab. I am looking forward to collaborating on exciting projects with my new colleagues in Calgary! After a successful (and fun!) Cross-Surface workshop at ACM ITS 2015, we are happy to announce that a follow-up workshop has been accepted to CHI 2016 in San Jose. Cross-Surface 2016 is the second workshop on interacting with multi-device ecologies "In the Wild", in which we specifically focus on the bring-your-own-device (BYOD) practice. Please have a look at the Call for Papers, and follow us on Twitter for updates. Submissions are due on January 5th January 29th (deadline extended!). I am excited to announce that I won the 2015 FWO–IBM Innovation Award for my PhD dissertation. This prize is awarded annually by Research Foundation Flanders (FWO) and IBM in recognition of an outstanding PhD thesis that presents an original contribution to informatics or its applications. 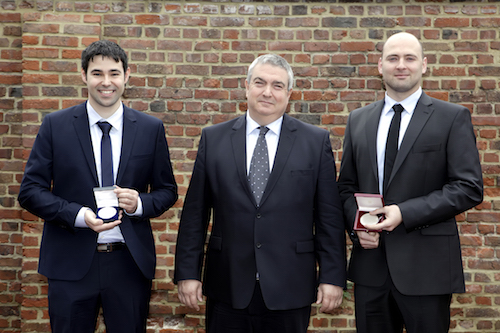 It is Belgium's oldest and most prestigious scientific award for research in computer science and its applications. 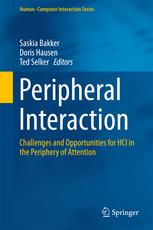 Our book chapter "Fluent Transitions Between Focused and Peripheral Interaction in Proxemic Interactions", co-authored with Steven Houben and Nicolai Marquardt, will be published in the Springer HCI Series book on Peripheral Interaction (to appear in Spring 2016). Charlie Pinder presented her work on mobile behaviour change interventions at British HCI 2015 (workshop paper) and MobileHCI 2015 (poster, workshop paper). Abhinav Mehrotra will present our workshop paper on interruptibility-aware experience sampling at Ubicomp 2015, and I will present our work on multi-device notifications at our ACM ITS 2015 Cross-Surface workshop. 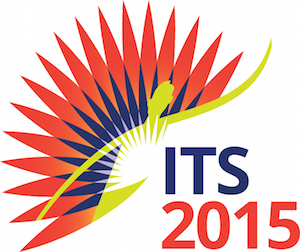 I am co-organising a workshop at ACM ITS 2015 on cross-device interaction, together with Steven Houben, Clemens Klokmose, Nicolai Marquardt, Johannes Schöning and Harald Reiterer. In the Cross-Surface 2015 workshop, we will review and discuss opportunities, technical challenges and problems with cross-device interactions in real-world interactive multi-surface and multi-device ecologies. Position papers will be due by early September, check out the workshop flyer! Our paper "Proxemic Flow: Dynamic Peripheral Floor Visualizations for Revealing and Mediating Large Surface Interactions" has been accepted to the INTERACT 2015 conference. 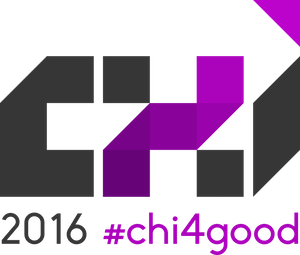 In April, I will be attending the CHI 2015 conference to present a works-in-progress paper and participate in the Mobile Collocated Interactions and Smart for Life workshops. This semester, I'm involved in teaching the Mobile & Ubiquitous Computing course. I will be teaching half of the module about Programming Mobile Applications for Android, while my co-lecturer Mirco Musolesi will focus on networking and sensing in mobile & ubiquitous computing systems. On 5th January, I start my new postdoc position as a Research Fellow in Human–Computer Interaction at the University of Birmingham in the UK, working with Russell Beale. I look forward to working on interesting projects with my new colleagues in Birmingham! 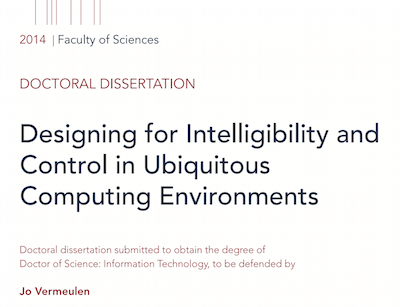 On 11th December, I successfully defended my PhD dissertation entitled "Designing for Intelligibility and Control in Ubiquitous Computing Environments". Thanks to my advisors Karin Coninx and Kris Luyten, and everyone at the EDM HCI group! Our poster "Overcoming Interaction Barriers in Large Public Displays Using Personal Devices" has been accepted to the ITS 2014 conference. 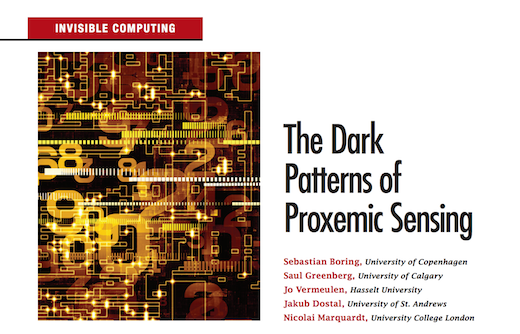 Our article "The Dark Patterns of Proxemic Sensing" will appear in Volume 47, Number 8 of IEEE Computer. Our paper "From Today's Augmented Houses to Tomorrow's Smart Homes: New Directions for Home Automation Research" has been accepted to the Ubicomp 2014 conference. Our paper "Dark Patterns in Proxemic Interactions: A Critical Perspective" has received the "Best Paper Award" (top 1% of submissions) at the DIS 2014 conference. 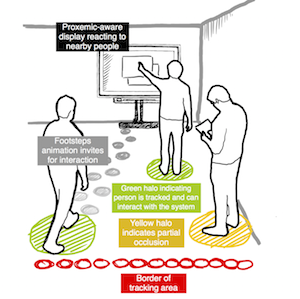 Our position paper "Addressing Challenges in Crowded Proxemics-Aware Installations" has been accepted to the DIS 2014 Workshop on SocialNUI: Social Perspectives in Natural User Interfaces. Looking forward to an exciting workshop! Students who participated in our "Current Trends in HCI" course (Dutch: "Actuele trends in HCI"), worked on a research project as part of the course and were guided in writing up the results as a paper submission. 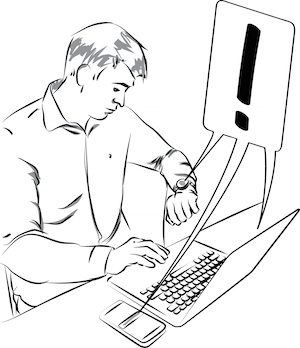 Congratulations to Yannick Bernaerts, Matthias Druwé and Sebastiaan Steensels who got their paper on "The Office Smartwatch" accepted to the DIS 2014 Provocations and Works-in-Progress track! Our note "The Design of Slow-Motion Feedback" and full paper "Dark Patterns in Proxemic Interactions: A Critical Perspective" have been accepted to the DIS 2014 conference. Our installation "Game of Tones" has been accepted to the CHI 2014 Interactivity track. It is a fun way to learn to play piano songs, which was developed by Linsey Raymaekers for her Bachelor's thesis. An earlier iteration (called "The Augmented Piano") was among the winners of the NUMA 2013 awards, and received some press coverage (in Dutch). I participated in Dagstuhl seminar #13452 on Proxemic Interactions. More information on the outcome of this seminar can be found in the Dagstuhl report. 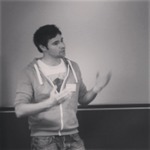 I attended CHI 2013 in Paris to present our paper "Crossing the Bridge over Norman's Gulf of Execution: Revealing Feedforward's True Identity", for which we received a "Best Paper Honorable Mention Award".